What a wonderful Yiddish Culture Festival last month! Four hundred people of all ages attended the Festival, which was co-presented by the JCC East Bay and co-sponsored by twenty-three local organizations. 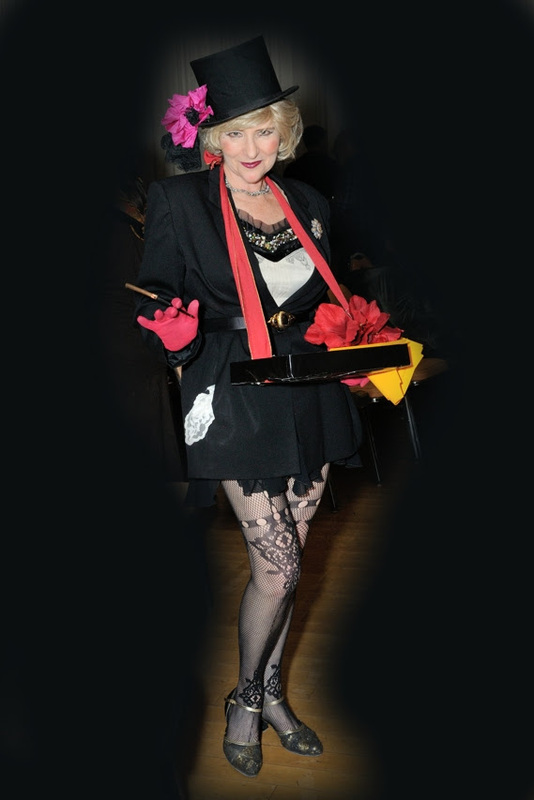 Our new "Cabaret & Cabernet" was a sold-out success, featuring eight outstanding performers showcasing a wide range of Bay Area Yiddish-inspired talents. The surprise appearance of ten-year-old Ariel Spagnolo delighted the audience with his rendition of Mickey Katz's English/Yiddish parody of "Sixteen Tons"
[best known through Tennessee Ernie Ford's 1955 recording]. 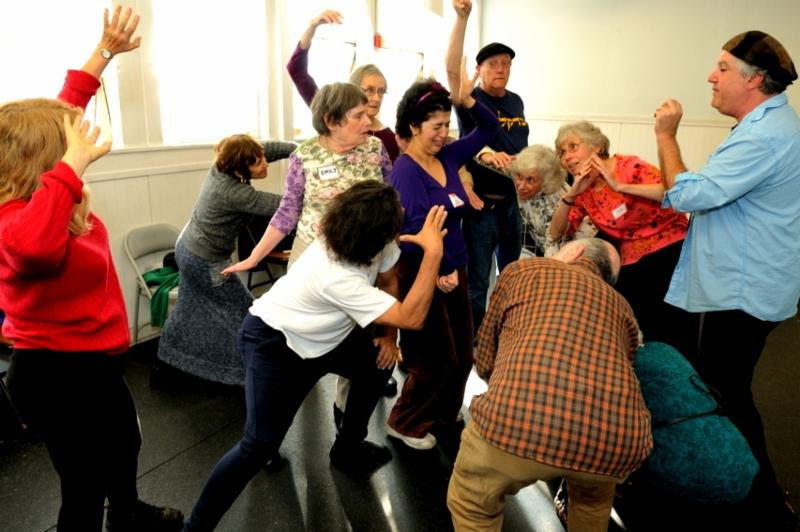 Sunday's many workshops (eighteen!) were great learning experiences and prompted impromptu jams during breaks for all to enjoy. The Festival's Finale began with the debut of tunes from Veretski Pass' new CD, Poyln: A Gilgul (Poland, a Metamorphosis), followed by a very freylekh (happy) dance party! Here a few pictures of the Festival. Look for many more in January's newsletter. Thank you to everyone who participated and also filled out an evaluation form. 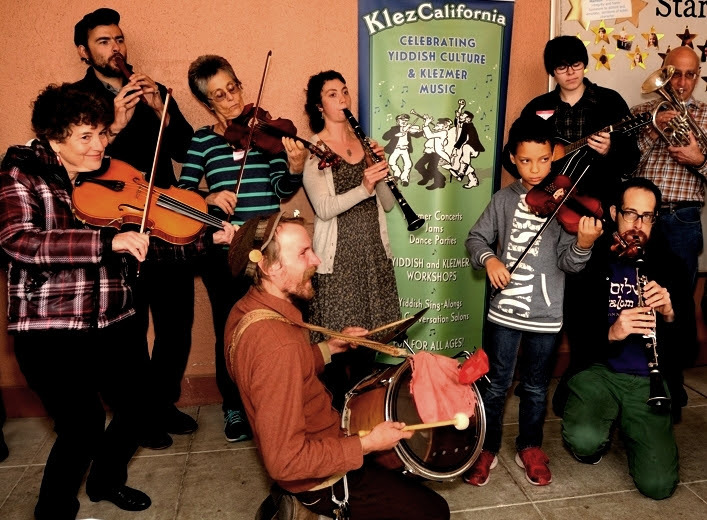 The Festival received many positive comments, including these: "KlezCalifornia is such a gift to the Bay Area.There is nothing like it west of the Mississippi." "Everything was AMAZING, fun. I learned a lot and feel inspired." I congratulate you on another terrific KlezCalifornia day of Yiddish culture. Enjoyed every minute." "You set the most wonderful table where we all can celebrate our delicious cultural banquet of arts together!" A freylekhn Khanikeh (Hanukkah, Chanukah) alemen -- HappyKhanikeh to all! (We transliterate the holiday's name to match the way you'll see it at the corresponding event.) We look forward to seeing some of you at KlezCalifornia's first community klezmer jam the first night of Khanikeh - see below. In a few days you will receive a request for a year-end gift to KlezCalifornia. We hope you will send us some Khanikeh gelt! 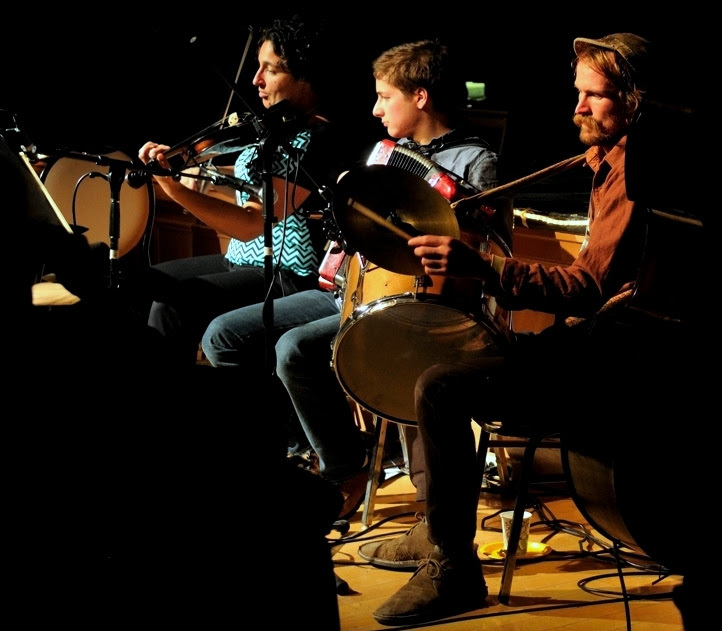 Sunday, December 6, 3:00-8:00pm, Klezmer Jam and Khanikeh Party. KlezCalifornia is sponsoring a klezmer/Balkan/etc. jam and party for musicians, singers, and dancers, led by Peter Bonos, trumpet and euphonium player and member of Orchestra Euphonos and Fanfare Zambaleta. All levels are welcome. 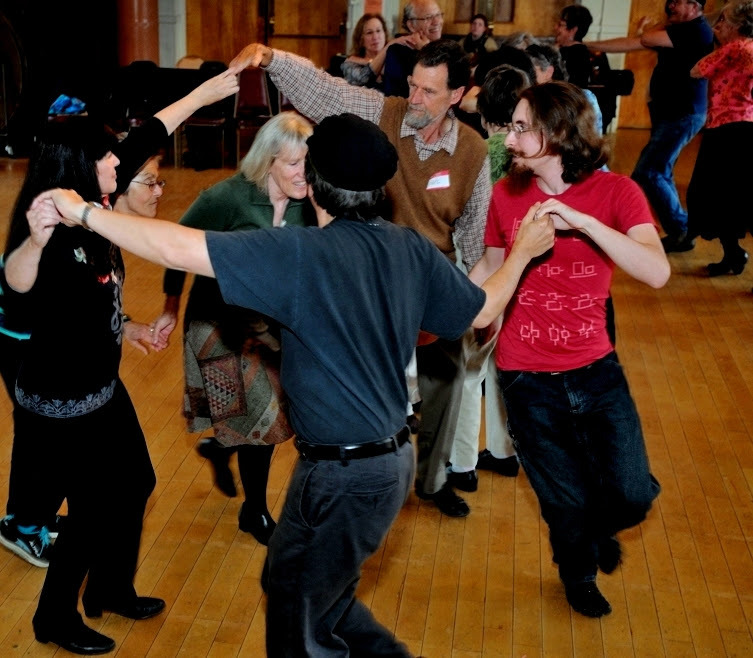 If you are a klezmer beginner it could be challenging, but we hope you'll find it fun. Please don't publicize this event on social media since it's in a private house and we'd like to know who's coming. No charge! Rsvp by December 4 to klezcaljam2015[at]gmail.com. At a private home, OAKLAND. ," from "Akheshverus (or Queen Esther: Biblical Operetta in Five Acts and 15 Scenes") by Abraham Goldfaden, father of Yiddish theater. This purim shpil (Purim play) premiered in Warsaw in 1885 and the recording is from 1901 (thanks to Len Fellman). by Ben Katchor gives a preview of their reinterpretation of "(Oy, Bin) Ikh A Mazldiker Yid" (I'm a lucky Jew!) (thanks to Nancy Kaye). Thursday, December 3, 6:30pm, Heather Klein, Yiddish Art Song. Part of "L'Chaim! To Life!" Jewish Music Series. Coffee and light refreshments at 6:00pm. No charge, but tickets required. More info: 707.664.2324, Sonoma State Jewish Music Series. Saturday, December 5, in the evening following havdoleh and dessert, Only in America: Jewish Songwriters on Broadway: The Music, the History, and the Genius, with Jacqui Silver.More info: 831.624.2015, Cong. Beth Israel. Thursday, December 10, 7:00pm, Hannuka Israeli Style. Come light the 5th candle with singing and Israeli and klezmer dancing to music by Majorly Minor. If you like, bring a dish to share, or a menorah and candles. No charge. More info: dalia.org[at]gmail.com. 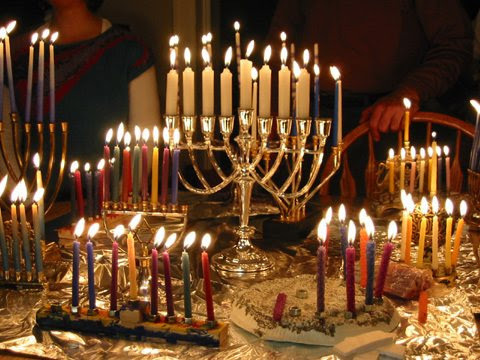 Sunday, December 13, 4:00pm, The Eighth Night of Hanukkah, with Nigunim Chorus, directed by Achi Ben Shalom. Candle lighting, concert of traditional and contemporary Jewish folk songs (Hebrew, Yiddish, English) in four-part harmony, and sing-along. No charge. More info:510.528.8872, mail[at]nigunim.org. 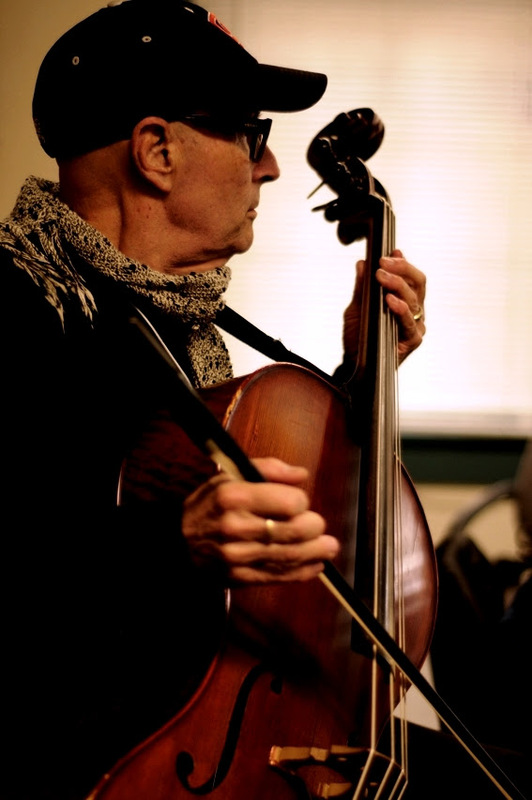 Monday, December 14, 6:00-8:00pm, Tony Phillips, Barbara Speed, Dave Rosenfeld play klezmer. Part of Klezmer Mondays. Entertainment free with minimum $10 purchase. 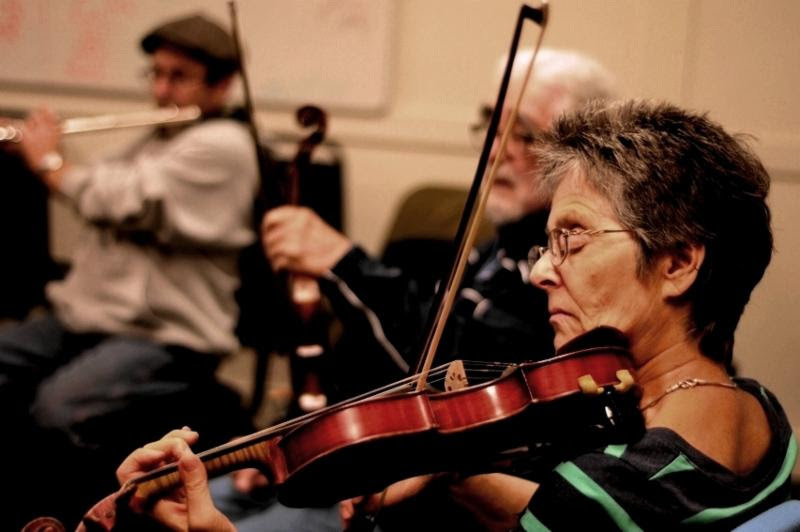 More info:Klezmer Mondays at Saul's. Friday, December 18, 6:15pm, Musical Shabes, with Mike Perlmutter, Dave Rosenfeld, and Cantor Risa Wallach. More info: 925.934.9446, Cong. B'nai Shalom. Monday, December 21, 6:00-8:00pm, Gypsy Moths. Part of Klezmer Mondays. Entertainment free with minimum $10 purchase. More info: Klezmer Mondays at Saul's. Talia Shaham: In memory of Gerda Koppel, mother of Karen Bergen - KlezCalifornia Board member and dear friend. Stories of Gerda's exceptional life and strength have been inspirational. May her memory be a blessing. Sunday, January 17, 2:00-4:00pm, KlezCalifornia Flisik Yidisheh Salon. For fluent Yiddish speakers. More info: 415.789.7679, flisik[at]klezcalifornia.org. At Jewish Community Library, SAN FRANCISCO.